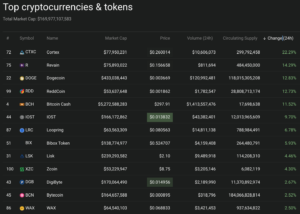 Bitcoin (BTC) is now trading at 5010 USD after retracing from a recent high of 5340 USD — the cryptocurrency market seems to be hanging on to most of the big gains from the last couple of days. 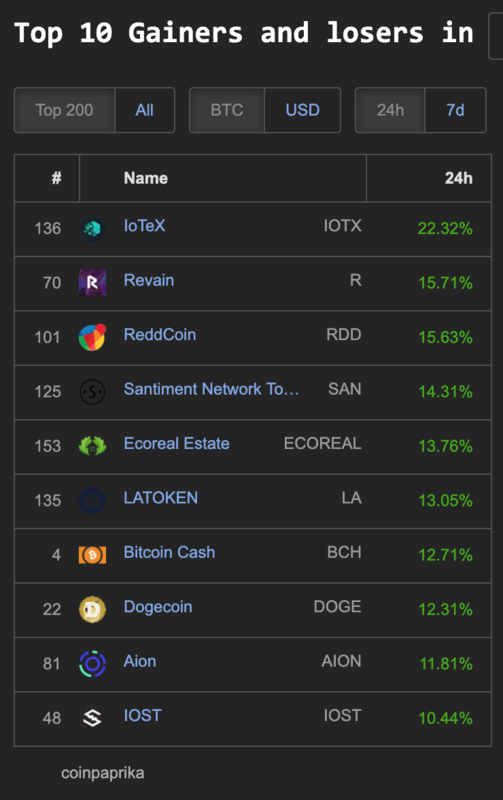 Coin360.io has 5 coins gaining double digit percentages in the top 100 market cap: Cortex (CTXC) 22%, Revain (R) 14%, Dogecoin (DOGE) 12%, ReddCoin (RDD) 12% and Bitcoin Cash (BCH) 11%. 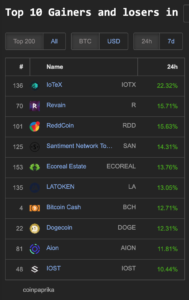 Top 10 coins within the 200 market cap on Coinpaprika.com: IoTex (IOTX) 22%, Revain (R) 15%, ReddCoin (15%), Santiment Network Token (SAN) 14%, Ecoreal Estate (ECOREAL) 13%, LATOKEN (LA) 13%, Bitcoin Cash (BCH) 12%, Dogecoin (DOGE) 12%, AION 11%, and IOST 10%. 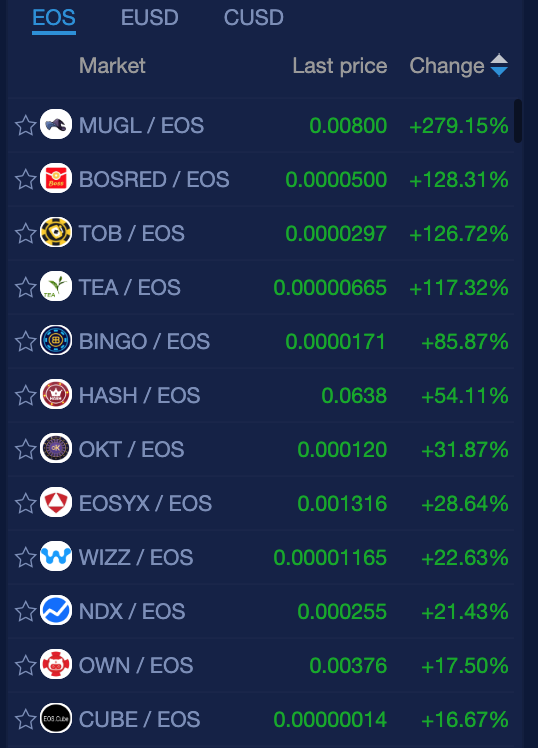 EOS platform coins & tokens lead the cryptocurrency market with 4 coins having 100% gains on NewDex.io: MUGL (279%), BOSRED (128%), TOB (126%), and TEA (117%). 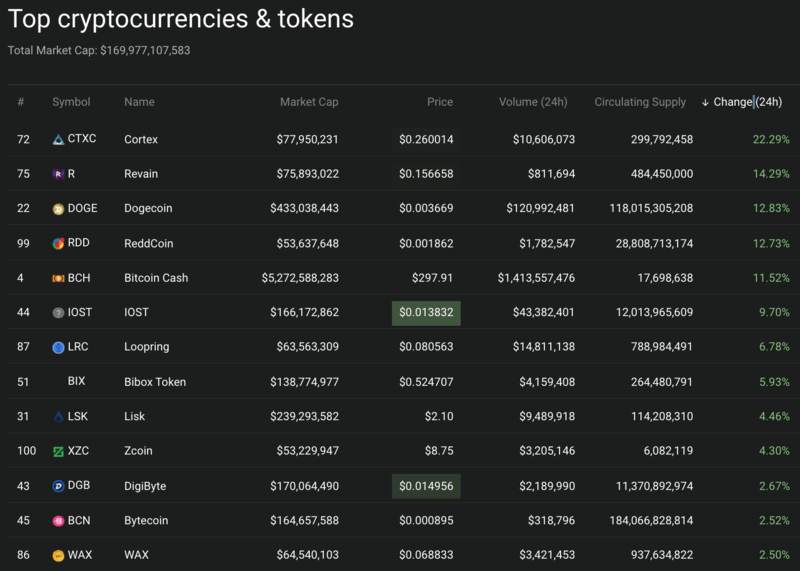 There are also 13 other coins gaining double digits—some of those non gambling coins/tokens include: EOSYX (28%), WIZZ (22%), NDX (21%), PEOS (13%) and ENB (12%). 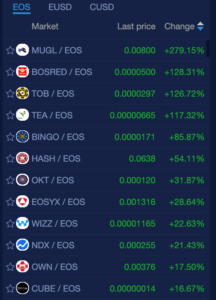 The biggest percentage gainers in crypto are found today trading on NewDex with EOS.